This time I would like to tell you about another inspection tool that I tested – Rigel Articulated Videoscope. 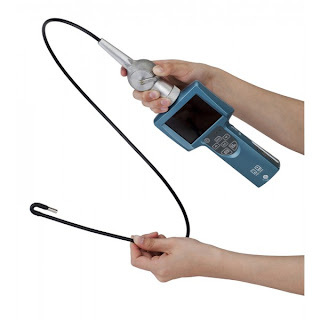 The extremely mobility of this videoscope makes it great for inspections, while a wide range of outstanding features including 300,000 pixel image resolution, a 3.5 inch LCD screen, a 2GB SD memory card, for image and video capture, Li-Ion rechargeable battery, LED lights to illuminate the inspection area, and inter-changeable waterproof probes, making it ideal for on the go inspection anywhere. So, I was allowed to examine a special pump at a plant. I will not tell you how I got there, but it was amazing experience. The large pump had special inlets for borescope inspection. The 2 meters length was just fine for that. The articulated tip allowed inserting the camera inside through the inlet hole and then it was possible to bend the tip in 2 directions to observe inner space better. The monitor of the videoscope presented a nice and clear live image of the inspection area. The rotating function of probe was also very convenient, because it was a nice substitute for more costly 4-way articulated videoscopes. I should say that the price of this Rigel videoscope was more than attractive, I found it the best price/quality ratio in the market. So, I recommend this nice inspection tool for observation hard-to-rich places in various technical aggregates – pumps, turbines, engines and what’s not!